Orthodontic dentistry is a branch of dentistry that aims to prevent and correct irregularities in teeth. Teeth and jaws that are positioned incorrectly can be treated with the help of orthodontics. Crooked teeth are difficult to clean and they increase the stress on chewing muscles. This leads to neck and back pain. Orthodontic options are available for patients of all ages. Orthodontic treatment aligns the teeth, improves the appearance, and increases the life of the teeth. Regardless of age, proper alignment of teeth is essential for good oral health and, if caught early in development, most cases can be easily corrected. 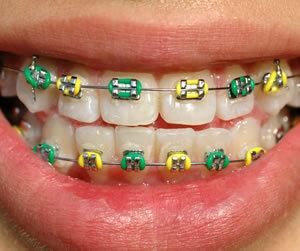 When most people hear the term “orthodontics” they think of years with a mouth full of metal, wires and rubber bands. That has now changed. Today, most orthodontic procedures can be completed without the use of brackets, wires or rubber bands. We can apply clear custom appliances no more than several millimeters in thickness to your teeth which can shift teeth into proper alignment. This office uses several types of braces, including Invisalign. Drs. Steven Litwin and John Farrugia are both certified Invisalign providers. They have successfully transformed smiles without the need for conventional braces. Other methods include the use of clear removable appliances applied at an early age that helps the bones of the mouth and eruption of teeth occur more favorably. This process is available through the use of Orthotain devices. For those cases where conventional braces are the only answer, technological advances offer faster-working and more aesthetically acceptable means of attaining a beautiful smile.